Hello everyone! I’m writing this the 22nd of January and we've had a modest turnaround this past week in terms of Winter weather with the Portland Jetport seeing 13.2” of snow over the course of three storms (Tuesday thundersnow, Saturday ice to snow, Monday a Norlun you-can't-predict-me trough). Still, this Winter so far has been far from rough and our first promising storm threat blasted south dropping feet of snow across the Mid Atlantic before thundering out to sea leaving us mainly high and dry. All in all, it looks like only a modestly wintry pattern will remain in place as El-Nino continues to dominate the pattern (see my last column for details). Enough with looking forward, let's take a look at some of the interesting weather over the past month here in Portland starting with the Cold Air Damming (CAD) event of 29th December. 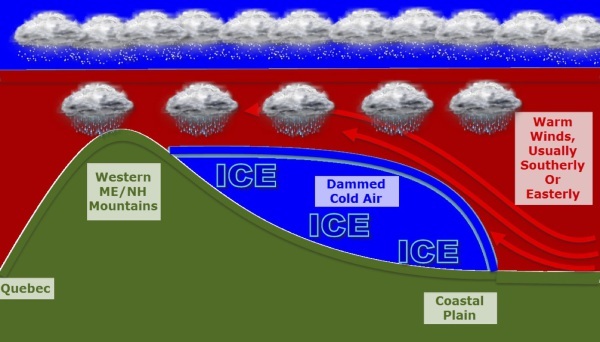 Cold Air Damming is a phenomenon observed often in Maine and it has everything to do with the mountains that lie to the NW. We've already talked about how the mountains can clear out storms more quickly than usual, so now let's see how they can make those storms nastier. Cold air is denser than warm air and thus tends to sink. That is one fundamental property of cold air. On 28th December, a cold high sunk south barely beating a warm front marching north ahead of a low moving through the Great Lakes. We had a lot of cold, dense air. As the low moved to our west, winds wanted to become south-easterly (winds blow counterclockwise around low pressure). However, as the atmosphere isn't two-dimensional, those warm SE winds ran into some issues. The warm air (SE winds off the warm water) began to push on the eastern edge of the cold air. The cold air began to displace west but ran into the mountains. Remember, cold air is dense air and it was in no mood to climb the mountains so it stayed put. The warm air still had to carry out it's duty to get to the low out west so it climbed up and over the cold air, contributing to snowfall and also keeping the surface nice and chilly. ​However, our mountains are only so tall. Once you get above 3,000 or so feet, there isn't quite enough mountain to have an appreciable effect on the weather in Portland. Warm air was able to flood in from the south aloft with no mountains to stop it. Because mountains are only so tall, CAD is usually a shallow phenomenon extending only a few thousand feet up. Above that, the atmosphere is at the mercy of larger scale phenomenon such as the low pressure out west. As as result, we saw a solid sleet storm across much of the area which contributed to lower totals and slicker roads along with heavier, harder to shovel snow. A general 4-8” was reported across the area which was in line with forecasts in the preceding days. Following this storm, we returned to the El-Nino fairly warm and calm pattern. This changed the week of the 11th thru 18th as we finally got cold air. After the crazy warm December, the ocean waters were warm. Warm water and cold air are a volatile combination and we certainly saw what it could do. We didn't have any massive region-wide snow events but that week saw a general 8-16” spread out over three events. They were generally dominated by mesoscale (small scale) phenomenon rather than sprawling storms. The first event arrived with the motto “short and sweet” on a Tuesday evening. A few hours of light snow ended in a vicious band packing 6” per hour snowfall rates, 40 m.p.h. winds, and thundersnow. This was the result of rapidly developing low pressure in the Gulf of Maine. As the low developed, another classic weather phenomenon developed known as the warm conveyer belt. A warm conveyer belt is when warm air moves rapidly and powerfully around a centre of low pressure depositing it on the NW side of the low. What happens when warm air smashes into cold air? You got it, lots of snow. In this case, the low bombed out at a rate of 12mb in 12 hours (that is the same rate needed for bombogenesis). Upper level features also supported a powerful warm conveyer belt (technical: negatively tilted H5 trough, H3 divergence, crazy H5 vortmax, topics for another day) and one unsurprisingly developed on Tuesday evening (the 12th). This resulted in a powerful band of snow forming over New Hampshire before moving NE into Maine. As the conveyer belt developed, the band intensified reaching peak intensity over Cumberland County between 10 and 11 p.m. 6” of snow fell in one hour just north of Sebego Lake, thunder ripped through the sky above Casco Bay, winds gusted over 40, temps dropped 10+ degrees and blizzard conditions were reported lasting for around an hour before tapering off. When all was said and done, a solid 4-8” was reported with some 8-12” amounts inland. That worked out very well with my forecast leading up to the event (you can go back and find every one of my forecasts on the blog if you wish to double check me yourself). What causes thundersnow you ask? The short answer is elevated instability. The surface was nice and warm just prior to the thundersnow. In fact, we were near 40 at the Jetport at 10 p.m. However, temps cooled drastically as you rose in height through the atmosphere even a little bit. How fast the atmosphere cools per unit of height is known as the lapse rate, The faster the air cools, the more unstable the atmosphere is. To get a visual on this, imagine a bunch of balloons in two rows. The top row of balloons are filled with sand making them heavy. They are dense and want to sink. They represent the cold air which is also dense and wanting to sink. The bottom row of balloons is filled with helium. The helium isn't dense at all and wants to rise. The helium filled balloons represent warm air which is less dense than cold air and also wants to rise. What will happen? Eventually the sand balloons will fall to the ground creating holes for the helium balloons to rise up out of. Because some of the atmosphere is taken up by cold air sinking, the area that all the warm air can rise through is limited. Because of this. when a hole does form, all the warm air rushes through it at the same time causing very local but very intense upward motion. So intense in fact, it can generate thunderstorms. Keep in mind, this process doesn't have much to say about the actual temperatures of the cold air and the warm air. So long as there is a large difference between the two over a short vertical distance, this process will work. This process produces showers and thunderstorms all year round. It is really hard though to get the air really cold just above the ground at the same time as the air at the surface is below freezing. You need a large difference for this process to work and it is hard to get that for thundersnow because there is a cap on how warm the warm air can be (it can't be above freezing or else it wouldn't be thundersnow. 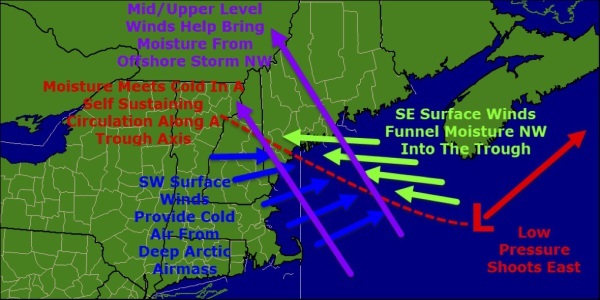 The second event was a developing coastal storm that raced NE through the Gulf of Maine. It was a fairly typical nor'easter with low pressure developing off the Carolina coast and racing NE. It had little upper level support and because of that, precip was created by the surface low but wasn't drawn NW by upper level low pressure. This resulted in heavy snow along the coast but little snow inland. Some freezing rain and sleet did occur in southern areas in the morning but dynamic cooling quickly led to temps cooling aloft allowing heavy snow to fall along the coast. The cutting off of the lows at the mid/upper levels prohibited moisture to be funneled NW and thus little snow fell in the mountains. The forecast verified at the coast but busted hard inland due to the lack of upper level features to funnel moisture NW. The final snow event of our mini-blitz arrived Monday 18 January as low pressure blasted well SE of the area. Low pressure developed over the Great lakes and a powerful upper level trough added some energy to the mix. Winds were also spreading out aloft causing air in the lower levels of the atmosphere to rise. When air spreads out aloft, it creates a void of low pressure. Air from below then rises to fill the gap. This creates large scale rising motion and light snow. Everyone saw a coating-2” or so because of that, which was well forecast. The fun part was a narrow band of moderate snow that developed in Casco Bay extending NW to around Windham. This band was a mini Norlun trough. cold available to the south and west). What happens when cold air runs into warm air? Yeah we've seen that happen before. As a result, a very narrow but respectable snow band formed and hung out for much of the day over and just north of Portland that Monday, bringing accumulations of 2-5” in the Portland area. Overall, a pretty interesting month in weather for Portland! Glancing ahead, the last week of January & first week of February looks warmer followed by more seasonable temps later into February. Keep in mind though, average temps are in the 20's in Portland this time of year. Even well above normal temps would still allow for snow from time to time so Winter is not over yet!